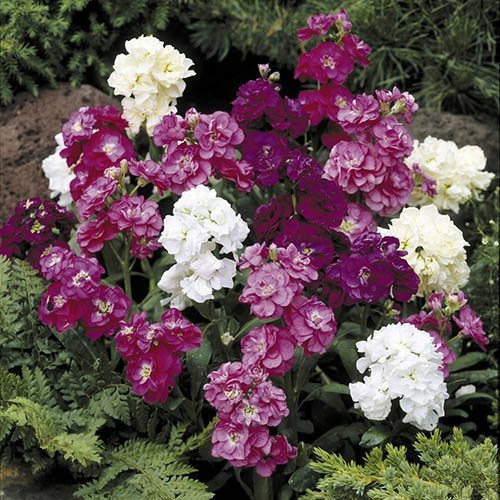 Bring a cottage garden feel to your garden with these gloriously scented stocks. Blooming in a wide range of pastel shades you'll have a profusion of perfumed double flowered spikes through early summer. At around 50cm tall they are a lovely plant for mid borders and a great subject for patio pots. Not only that but you'll have plenty of fragrant blooms for cutting. Supplied as a pack of 40 mixed colour plug plants ready to plant out. Bring a cottage garden feel to your garden with these gloriously scented stocks. Blooming in a wide range of pastel shades you'll have a profusion of perfumed double flowered spikes through early summer. At around 50cm tall they are a lovely plant for mid borders and a great subject for patio pots. Not only that but you'll have plenty of fragrant blooms for cutting. Supplied as a pack of 40 plugs (1.5 - 2cm diameter). Pot on for 4-6 weeks and plant out after last frosts.